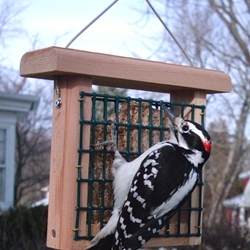 Birds love high energy suet and will love this suet feeder filled with Nature's Way roasted mealworm suet cakes. FEEDER FEATURES: Heavy gauge vinyl coated wire mesh. Cedar and stainless steel screw construction. Stainless steel cables for hanging. Directions for use.